NetherRealm Studios and Warner Bros have revealed a new character for Mortal Kombat 11. 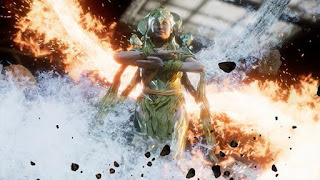 The character, Cetrion, was exclusively showcased by Game Informer who have published an exclusive coverage trailer which you can check out below. Cetrion is an Elder God whose moveset featuring various elemental abilities highlights her connection to the Earth. Judging by the trailer, she controls the elements of water, earth and fire (she’s one element away from being the avatar). Mortal Kombat 11 releases on April 23 for PS4, Xbox One, Nintendo Switch and PC. Labels: Mortal Kombat, Mortal Kombat 11, NetherRealm Studios, Warner Bros.